Many women’s organizations declared simply as Gabriela did in the Philippines in 1988 that “women’s rights are human rights,” while lawyers and legal academics sought to bridge the gap between international human rights theory and women’s rights. 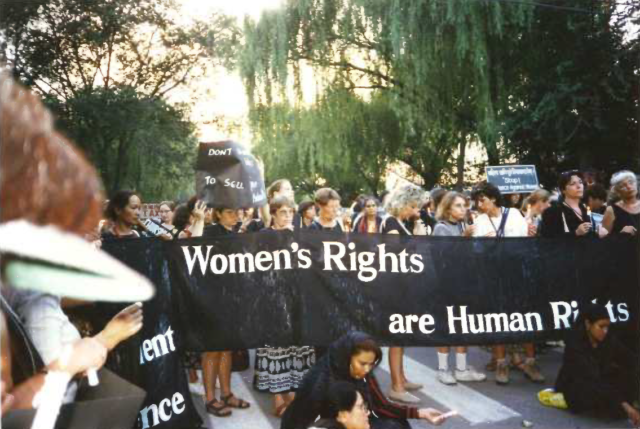 A number of global and regional meetings advanced the framework for women’s human rights; two of note that influenced organizing for Vienna and resulted in influential books were a “Consultation on Women’s International Human Rights Law” hosted by the International Human Rights Program at the Faculty of Law, University of Toronto in September, 1992, and a broader NGO international conference alongside it “Linking Hands for Changing Laws: Women’s Rights as Human Rights Around the World” in Toronto sponsored by the North-South Institute. This groundswell was also reflected in the establishment of women-specific caucuses and programs in mainstream human rights organizations, like the Women’s Rights Division at Human Rights Watch which started to document violations that had previously been ignored. As the 1993 UN World Conference on Human Rights approached, new cases of violations of women’s human rights in the family, situations of war, the workplace, and the public sphere became more apparent, uncovering a reality that could no longer be ignored.